Last month a group of young travelers and adult ambassadors from No Barriers embarked on a two-week expedition led by Above the Clouds in Nepal designed to break through perceived barriers and grow as a team. We here at Above the Clouds were deeply inspired by their journey, their mission, and their enthusiasm - so we wanted to share some of their adventure and experiences with you! In the remote Mustang region of Nepal, high on the Tibetan plateau, a diverse group of students and adult leaders of all different abilties who are passionate about social change had the opportunity to grow in their understanding of the world as they embarked on this one-of-a-kind, handcrafted adventure into the Nepali Himalayas. No Barriers is an organization founded on a mission to unleash the potential of the human spirit. No Barriers Youth is their premier educational program challenging young people to contribute their absolute best to the world through transformative experiences, classroom tools, and real-world inspiration. Twelve impressive students, 15-19 year olds, with an array of physical and/or invisible barriers were led by a crew of expedition leaders and local staff on this journey. They were joined by four inspiring No Barriers Ambassadors: Erik Weihenmayer, co-founder of No Barriers and the first blind person to reach the summit of Mount Everest; Bill Barkeley, a deaf-blind adventurer, marathoner, and No Barriers board member; Mandy Harvey, a musician and 2018 America's Got Talent finalist with perfect pitch who happens to be deaf; and Command Sergeant Major Gretchen Evans, US Army veteran and author who lost her hearing in a rocket blast while serving overseas. After nearly two days in transit from Denver, Colorado, the real journey began in the thriving city of Kathmandu. From there the team traveled to the trekking capital of Pokhara and onto the remote region of Mustang. They participated in cultural-exchange activities, local community immersion, and learned about sustainable development, while soaking up the art, history, and culture of this fascinating destination. One of the group's first stops was at a School for the Deaf in Pokhara where they met with the students and conquered the language barrier in seriously impressive ways: translations went from Nepali sign language to American sign language to English or Nepali to English, then English sign language to Nepali sign language, then back again! Once into Mustang, the group made use of all available modes of transportation, accessing the region on horseback, in jeeps, and on foot. Throughout the journey, the team visited ancient holy sites, traversed the unique landscapes, and participated in team-building activities. Off the trail & back in Kathmandu, they explored the city and spent a morning at Swayambhunath, the Monkey Temple. 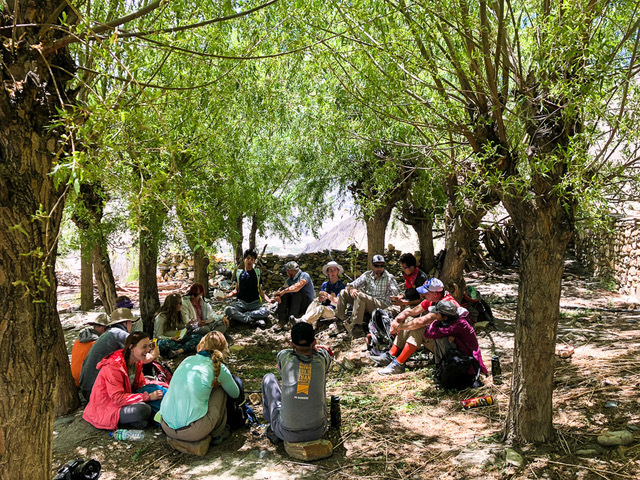 The goal of the experience was bigger than just two weeks in a wondrous country; after reaching their personal “Summit," the teens returned home and will use what they’ve learned about Mustang, and about themselves, to elevate their lives and their communities. You can learn more about the No Barriers organization and read the full day-by-day blog of their adventures HERE!